One of the most critical requirements for safe and reliable nuclear power plant operations is the availability of competent maintenance personnel. However, just as the nuclear power industry is experiencing a renaissance, it is also experiencing an exodus of seasoned maintenance professionals due to retirement. The perfect guide for engineers just entering the field or experienced maintenance supervisors who need to keep abreast of the latest industry best practices, Nuclear Power Plant Maintenance: Mechanical Systems, Equipment and Safety covers the most common issues faced in day-to-day operations and provides practical, technically proven solutions. 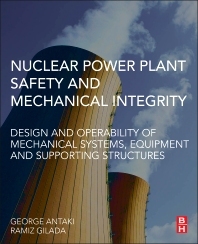 The book also explains how to navigate the various maintenance codes, standards and regulations for the nuclear power industry. Mr. Antaki is Chairman of ASME III (Nuclear) Working Group Piping Design, member of ASME-QME (Qualification of Mechanical Equipment, Nuclear), and member of ASME III (nuclear) Subgroup Component Design, and ASME (nuclear) Operation and Maintenance Committee. He has over 37 years of experience in nuclear plant engineering, and is an instructor of nuclear engineering courses for the ASME. Mr. Antaki was Manager of Systems structural Analysis at Westinghouse (one of the leading reactor designers), and is currently Chief Engineer Becht Nuclear Services. Mr. Gilada has 33 years of experience in Mechanical and Civil Construction and Design Projects. He developed expertise as Principal Consultant Engineer in Comanche Peak Nuclear Power Plant in Structural Dynamics and Piping Engineering and performed acting managerial duties as needed. He is a member of ASME III (Nuclear) Working Group Piping Design, Working Group Flaw Evaluation and ASME (Nuclear) Operation and Maintenance Committee. He successfully completed Nuclear Plant Certification Class in Reactor Theory, Thermodynamics, Fluid Flow, Heat Transfer and Plant Systems.